A country’s international airport is not only the gateway to a country, it is also the first and last impression a visitor – either foreign or Filipino – gets of the country. For this very reason, it is imperative we get our country’s airport strategy right. Part of that strategy necessarily includes fixing the sad state of the Ninoy Aquino International Airport or NAIA. By now, many of you have read or heard that NAIA has fallen further behind in an online survey and is now ranked one of the five worst airports in the world and the worst in Asia. The basic complaint has to do with the old facilities and the less-than-friendly service passengers receive. Overall, NAIA delivers a less than satisfactory travel or customer experience for the passenger. This is only highlighted when compared to the facilities and services of other international airports located right in the region such as in Singapore, Hongkong, Bangkok, and Kuala Lumpur. The key question is, can anything be done to fix this sorry situation? At the National Competitiveness Council, we believe that solutions can be arrived at to address this picture in relatively short order and in a manner consistent with a long-term airport strategy. In fact, when I was invited to join the NCC one of the first projects I was asked to look into was the renovation of NAIA. I believed it was necessary to fix the situation at NAIA for several reasons. First, we needed to create a better first impression for visitors. Second, we needed more passenger capacity within our overall airport system if we wanted to increase the number of international visitors and domestic tourists. And third, we needed to recognize that the airport played a role in projecting our national brand. The customer experience at the airport should be aligned with our international reputation for our warm hospitality. The airport, we felt, could also be a venue for projecting our culture visibly and through the service which passengers experience. Sometime in early April, we convened the first meeting of a team led by Manila International Airport Authority General Manager (Gen.) Angelo Honrado, NAIA Terminal Manager Dante Basanta together with architects and designers Budji Layug, Royal Pineda, and Kenneth Cobonpue. Before we started the actual design process, we studied the situation in the entire Manila International Airport Authority. MIAA is actually composed of four terminals : NAIA, Terminal 2 or Centennial, Terminal 3, and the Domestic Airport. NAIA was designed by Leandro Locsin (later named a National Artist). Its construction was started in 1978 and the facility was completed in 1981. At 67,000 square meters, it was originally designed to handle 4.5 million passengers per year. It reached its capacity in 1991 (yes, 20 years ago) and with some improvements and additions, its capacity was extended to 6.0 million passengers per year. 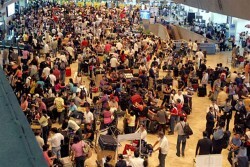 NAIA handled 7.3 million passengers in 2010. It presently services about 30 international airlines. Terminal 2 services Philippine Airlines – both domestic and international operations – although it was originally designed as a domestic airport. It was designed to serve 7.5 million passengers a year but handled about 8.9 million in 2010. Terminal 3 handles mainly Cebu Pacific – both domestic and international – although that terminal was originally designed as an international airport. It also handles one international carrier (ANA) as well as some flights of AirPhilippines Express and Philippine Airlines. Although it continues to be mired in a long-running legal battle and has never been fully opened as the international airport, last year Terminal 3 already handled 9.5 million passengers. It was designed to handle 14 million passengers per year. The Old Domestic Airport handles small carriers servicing domestic routes too small to be handled by some of the larger carriers. It has a capacity of 3 million passengers per year and handled 1.4 million last year. Out of a total capacity for the MIAA system of 31 million passengers per year, those four terminals already service 27.1 million people and should reach capacity in the next year or two, with NAIA 1 and 2 highly congested. Those numbers led us to a number of conclusions. First, all four terminals of MIAA need to remain in operation for many more years. Even if Terminal 3 were opened, there is no way one can shift all the capacity from NAIA to Terminal 3 and shut down NAIA. Second, even if Clark were opened, it seemed inconceivable that all traffic could be diverted there even assuming that a high-speed rail link could be established between Metro Manila and Clark. At the very least, it would take years to complete so fixing NAIA and getting Terminal 3 fully open makes so much sense now. The needs are immediate. With that in mind, the team set out to create a renovation design for NAIA in conjunction with the airport’s own engineers and architects. In designing the changes, the basic mission was to transform NAIA into a “boutique” airport in comparison to the region’s larger international airports and improve the passenger’s travel experience to and from the Philippines in terms of service, comfort, and facilities. The whole idea was to create a new “Modern Filipino” gateway to the Philippines to welcome and send off visitors. Rather than try to compete on size, the concept was to compete on service and customer experience. No thought was entertained to change the structure of the building or to expand its present size since maintaining and not affecting the structural integrity of the building was of paramount importance. The solution was to clear some design structures and for the airport to streamline some steps which passengers have to undergo. While this does not add any space to the overall structure, it serves to smoothen out the flow of people movement within the terminal. While the oft-quoted problem of bathrooms is being addressed – they are being renovated in batches – one other problem often cited by passengers is the lack of food outlets and restaurants. This can be easily addressed by rationalizing the mix of restaurants and shops throughout the terminal. As it is, neither shops nor restaurants are up to par with those seen in other international airports in the region. Even duty free shops are being asked for an upgrade by their own merchants in order to bring them up to international standards. While that is going on, it makes even more sense for NAIA to undergo its own makeover so that its own upgraded facilities match that of the duty free shops. There are many other problems at NAIA but the main point is that it is possible to fix these problems and create the improvements if a decision were to be made now. The problems are not limited to the inside of the terminal. One of the worst problems lies right outside. When one exits the terminal, those not being picked up by a hotel car – which is the vast majority of passengers – have to work their way down a steep ramp to the Arrival Extension level to be picked by their cars or to be met by people outside in the parking lot. For most people walking down that ramp, the experience is more like being dragged down by your own luggage. That first step outside the terminal for a first-time visitor to the Philippines can be a rude introduction to the country. For the greeters outside, the experience is not much better. An open-air parking lot blocked off by a fence from the arrival extension area keeps crowds away – and either sweltering in the heat or soaked by rain. Considering that such greeters travel great distances and wait for long to meet people at the airport, it makes sense to design a better area with stores, restaurants, and shade and seating areas so people can be comfortable. Again, this is possible since the space is available to begin with. Such space can be useful for greeters and commercially successful at the same time so it pays its way. Much of the design work has already been carried out by a great team and the engineers and architects of NAIA have done much of the technical work. I believe there is no time to waste in getting this job done. If this relatively simple mission cannot be carried out, there is little reason to believe that people will be convinced that much more complex tasks can be carried out.